Passover haggadahs, like the Passover seders themselves, have striven to engage readers as they recite and reenact the story of the birth of the Jewish people. While the haggadah text may remain constant, haggadah illustrations have been visual tools that have drawn in readers through the centuries. While the individual illustrations themselves may vary from haggadah to haggadah, one rather unexpected scene has recurred throughout various haggadah texts: rabbit-hunting. Rabbits, and specifically rabbits being hunted, have appeared in a number of haggadahs, in spite of the fact that rabbits neither feature in the Passover story, nor are they even kosher animals. Because of Jewish dietary laws, as well as the historic socioeconomic status of the Jews, hunting was never a part of Jewish life, much less something that could be expected to be found in connection with the origin story of the Jewish people. A number of explanations have been offered for the prevalence of rabbits and hunting in haggadah illustrations. One of the most popular argues that its purpose was to illustrate a mnemonic of Jewish law. In Ashkenazi manuscripts (including the Cincinnati, Ashkenazi, Prague, Venice, and Augsburg Haggadahs), this rabbit-hunting scene is often featured next to the text for the special Kiddush (the blessing over the wine) that is recited when the first day of Passover falls on a Saturday evening, right after the Sabbath. 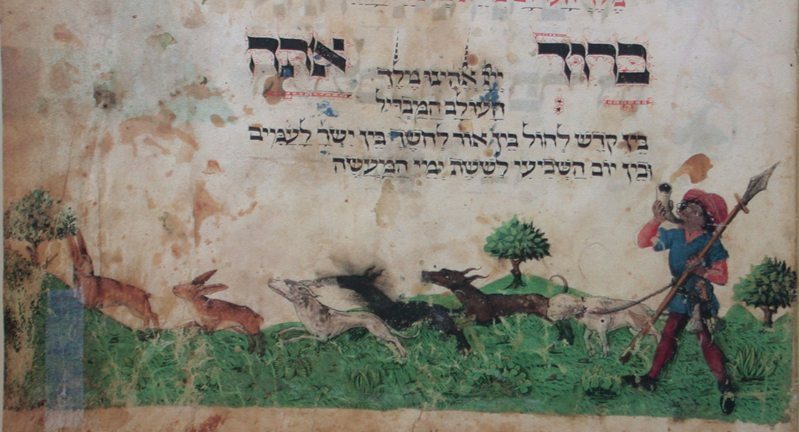 Since this hunting scene is so often juxtaposed with this Kiddush, many see a connection between them, and point to the Cincinnati and Venice Haggadahs, in which the acronym YaKNeHaZ (יקנה”ז) appears next to the hunting scene. YaKNeHaZ refers to a discussion in the Talmud regarding the proper order for rituals, including the Kiddush, when a holiday falls immediately after the Sabbath. 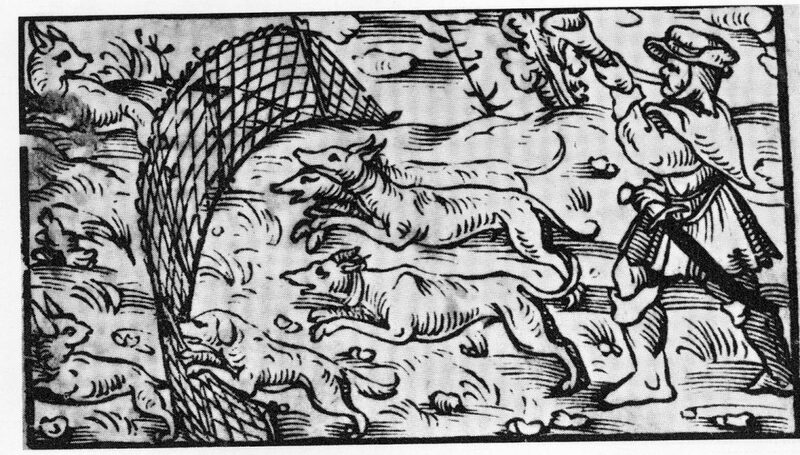 At the same time, the pronunciation of YaKNeHaZ sounds rather similar to the old German phrase “jag den Has,” “hunt the hare.” It would seem, therefore, that this rabbit-hunting scene was included in the haggadah by the Kiddush as an illustration of the Kiddush-related mnemonic for its German or Germanic language-speaking readers. Instead, it is possible that the Jewish artists who illustrated the haggadahs simply chose a theme that they were familiar with. Hunting, and rabbit-hunting in particular, was a motif that recurred in western art—and not necessarily in specifically Jewish contexts—dating back to the Roman period. 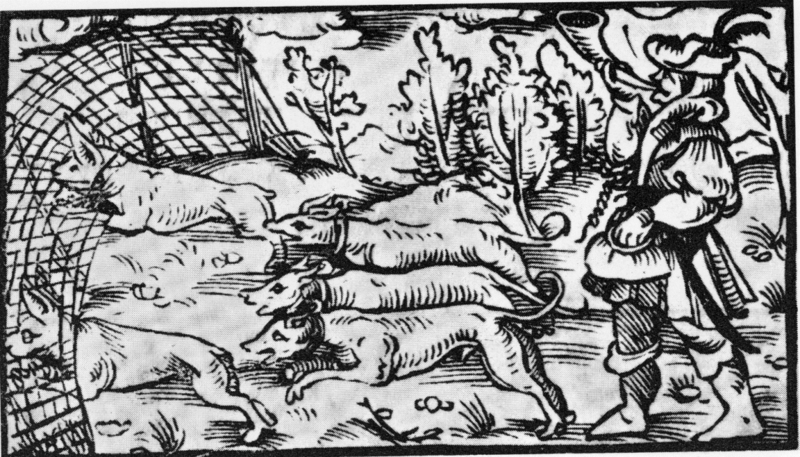 Indeed, rabbit-hunting was one of the more popular hunting scenes that artists and manuscript illustrators depicted in their work, and rabbit hunts could also be found in Jewish Biblical art. In fact, the Golden Haggadah and the Sarajevo Haggadah use this Biblical art motif in their inclusion of an image of Esau as a hunter bringing his catch—a rabbit—to his father Isaac. The artists that worked on the haggadahs, who had access to these scenes within European culture, may have adopted imagery that could be used as a metaphor for the Jewish people. In examining these rabbit-hunting scenes, particularly through the lens of European culture, it becomes clear that the rabbit perpetually represents a symbol of prey: it is always the hunted, never the hunter. It is possible to understand the rabbit as it appears in the haggadah as representing the Jewish people as a nation that has been pursued, both after the Exodus from Egypt, as well as throughout the subsequent generations. 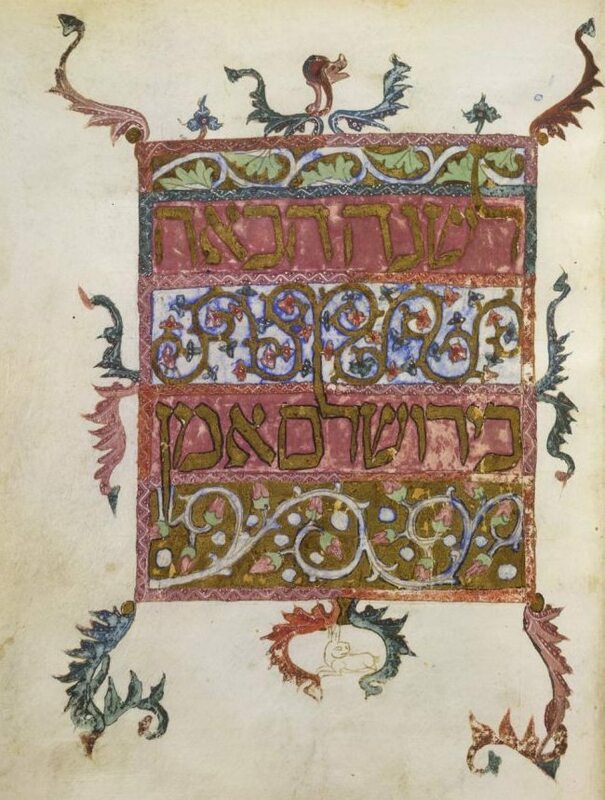 Indeed, this connection is made particularly explicit in the Sarajevo Haggadah, which depicts the rabbit fleeing from its pursuers above the word “ויענונו,” “and they oppressed us,” drawing a clear parallel between the persecution of the rabbit and that of the Jews. Moreover, in the Barcelona Haggadah the rabbit sits peacefully under the phrase “לשנה הבא בירושלים,” “next year in Jerusalem,” driving home the connection between the rabbit who is at peace in the Holy Land, and the hope expressed by the seder participants for the arrival of a peaceful, messianic age. Similarly, another take on the rabbit as representing the Jewish people is the 1983 Moss Haggadah, illustrated by David Moss. One of Moss’ illustrations features 12 medallions, 11 of which depict an eagle grasping a rabbit in its talons. 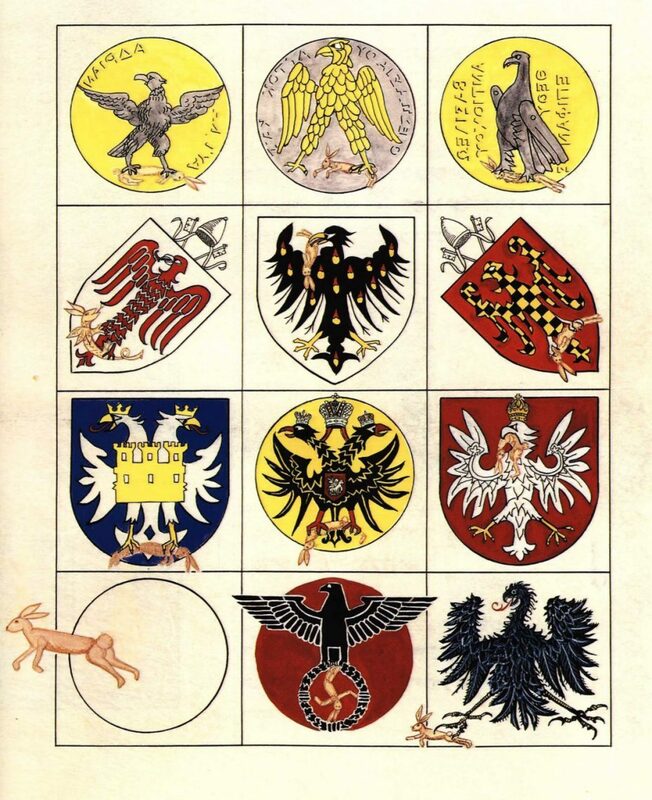 Each eagle represents an empire that persecuted the Jews, with the trapped rabbit representing the Jewish people. However, the final medallion shows the rabbit escaping: the ultimate triumph of the Jewish people. Page 7b from the Moss Haggadah—The Eagle and the Hare—The Hunt for an Image. © 2017 by David Moss. Reproduced courtesy of Bet Alpha Editions, California. All rights reserved. There is also another facet of the metaphor of the rabbit as the Jewish people. Just as the rabbit uses its wits and agility to escape its pursuers, so too the Jewish people, with God’s help, have been able to outwit and “outrun” their oppressors from Egypt and beyond. For example, the Barcelona Haggadah includes, in addition to the rabbit at rest, a rabbit-hunting scene, in which the rabbit glances back at its pursuers as it makes its escape. 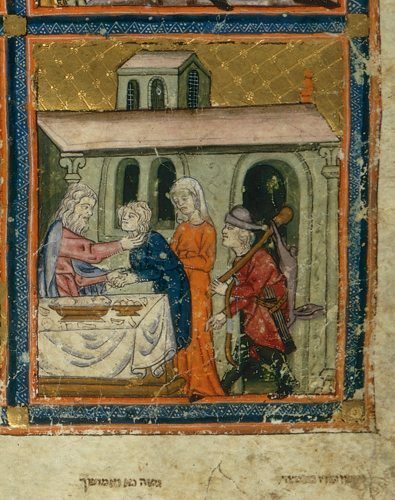 Perhaps the best illustration of this, however, can be found in the Augsburg Haggadah, which was mentioned previously. 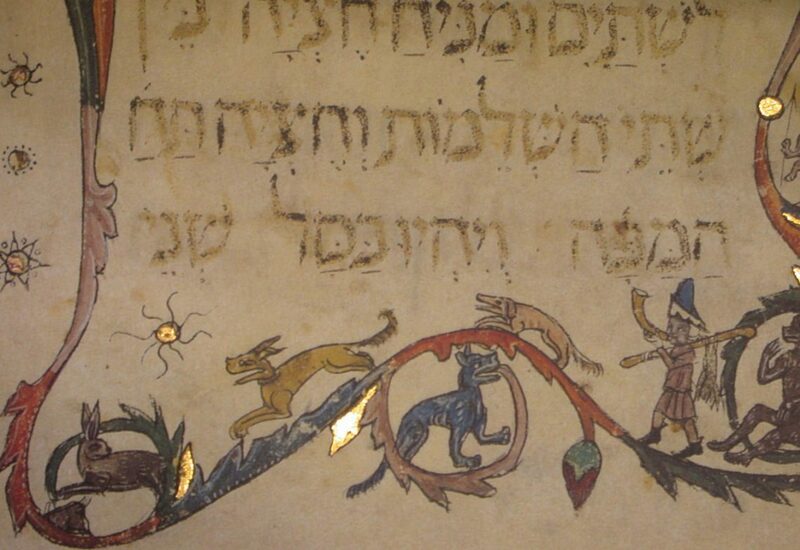 This haggadah includes two rabbit-hunting scenes. The first depicts a rabbit on the run from a hunter and his dogs. The rabbit runs towards a net, and it appears inevitable that it will be caught. In the next illustration, however, the net has been miraculously lifted up, and the rabbit, against all odds, is able to escape. Nonetheless, in spite of its popularity within Jewish illustrations, the rabbit is not a natural symbol for representing the Jewish people. The rabbit is not a kosher animal and, in fact, is explicitly mentioned in the Torah as being forbidden for consumption because it chews its cut without having split hooves (the pig, perhaps considered to be the most non-kosher animal of them all, is included in the same list of forbidden animals). 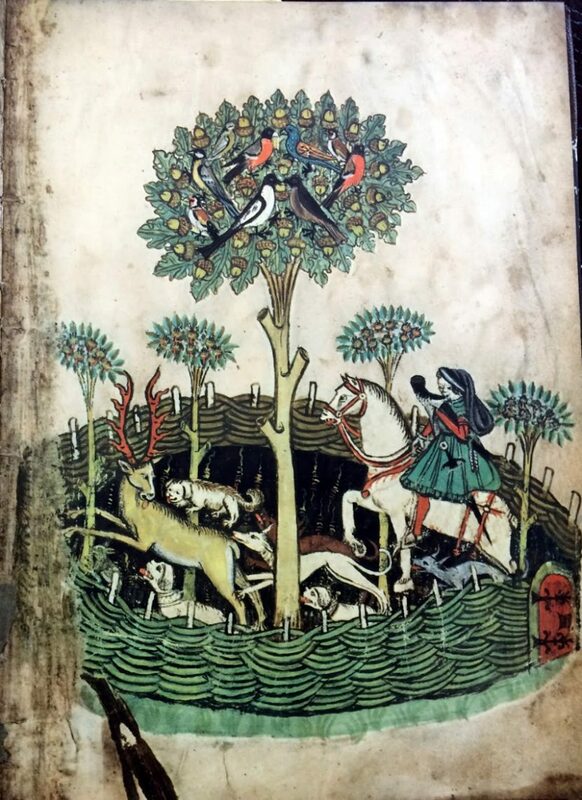 Similarly, as mentioned previously, the Gutwirth-Zucker Prague Haggadah also contains only a deer-hunting scene (see above for the illustration). 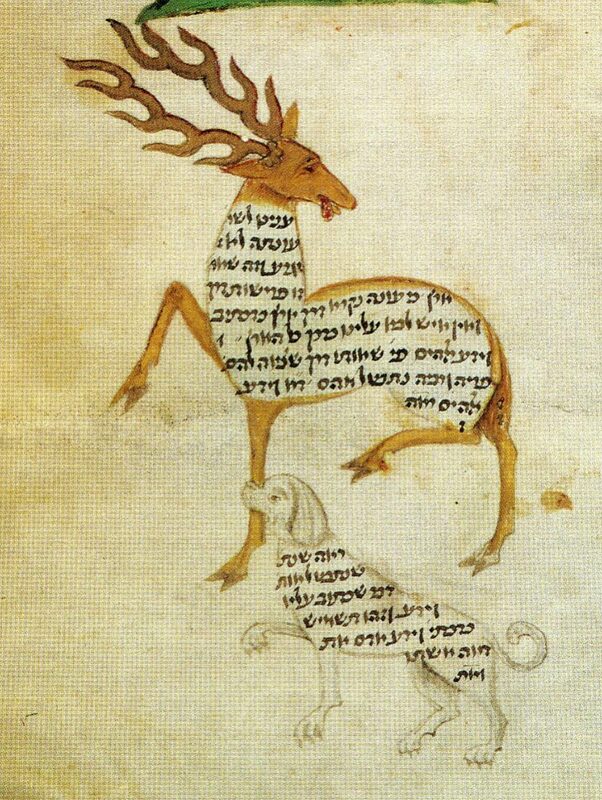 Meanwhile, the Reynolds Haggadah hedges its bets, and includes depictions of both deer and rabbits in illustrations that accompany the piyyutim (liturgical poetry) of Passover. Finally, the similarly aforementioned Ashkenazi Haggadah, which does include a rabbit-hunting scene, also includes two marginalia scenes, one of which features a fictional predator chasing a fantastical—albeit clearly kosher—prey. Neither of the animals depicted actually exist, but it is clear that the prey is a kosher animal. The other scene has a dog chasing a deer. Whatever the ultimate reason for the rabbit’s inclusion in the haggadah, it has served as a reminder of the Jewish people’s past, their resourcefulness, as well as the ultimate hope of escape from persecution. While it may be one of the more unexpected images to be associated with the Jewish people, Passover is a time when we tell the story of a group of slaves who rose to take control of their own destinies and survive throughout the centuries in spite of nearly insurmountable odds. Rabbits, in the end, may be the least surprising part of the Passover story.